Champagne Jargon - key terminology explained! There are lots of terminology and jargon surrounding Champagne and wine making. To help us with all of this we have put together a glossary of key champagne and wine related terms. This is only a starter as we plan to be addding to it all the time. A town just outside Epernay that is one of only 17 villages holding Grand Cru status. 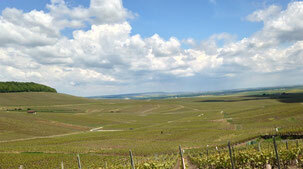 Aÿ has large South facing slopes primarily planted with Pinot Noir producing full flavoured Champagnes. A Grand Cru Champagne Village. Ambonnay’s unique geography produces grapes a little riper than elsewhere due to being a few degrees warmer. A Grand Cru village on the Côte des Blancs where Chardonnay is by far the predominant grape grown. The Côte des Blancs is home to some of the finest Blanc de Blancs (100% Chardonnay) Champagnes. The process of mixing together still wines from different grapes, different villages and different years to make a blend that is superior to each individual wine. Assemblage takes place in the spring of each year and the resulting blend is put into bottles for the second fermentation and ageing. A Grand Cru village split by the busy main Reims - Châlons road. A Grand Cru village with some very good vineyards particularly the top half of the wide slope behind the village – known as ‘derrière le château’. The action of stirring the still wine in the vat or barrel after the first fermentation. 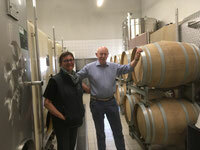 This agitates the dead yeast sediment in the wine and promotes the development of aromas and flavours. A plastic stopper that fits inside the metal cap used to seal the bottles whilst they age in the cellars. They let just the right amount of air into the bottle so the wine can age properly. The bud that grows out of a vine in in the Spring-time. The metal crown cap that, with the Bidule, seals the bottle during the second fermentation and subsequent ageing in the cellars. The process of adding sugar to pressed grape juice before fermenting it into wine. This is done in years when the natural sugar content in the grapes is low. This process makes sure that the level of alcohol in the wine is maintained. The name given to the first juice that comes from out of the press. La Cuvée will contain a higher level of sugar and acid then the juice that runs off later in the pressing process. As these are two vital ingredients in making good Champagne, La Cuvée is therefore the most prized juice. A word used in the quality ranking system amongst Champagne villages and their vineyards. 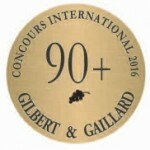 At the top are 17 Grand Cru villages (ranked as 100% quality), followed by 41 Premier Cru villages (90-99%) followed by all the other villages (ranked between 80-89%) which are given the designation Cru. Formely known as Châlons-sur-Marne is the administrative capital of the region. Across the Champagne region there is a thick layer of chalk under a thin layer of top soil. The chalk ensures good drainage and retains heat from the sun, allowing grapes to ripen more than would otherwise be the case. The governing body of the Champagne industry. A grouping of grape growers or small champagne makers who pool their resources. Cooperative members usually sell their grapes to the Cooperative and then allow the Cooperative to press the grapes and turn the juice into Champagne. The output will then either be marketed under the Cooperative’s own brand name or handed back to the grower and marketed under their own individual brand name. 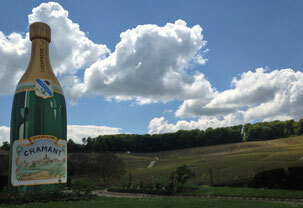 The Côte des Blancs is an area of Champagne vineyards south of Epernay stretching for about 20 km. The Côte des Blancs is a mostly eastern-facing slope famed for its Chardonnay grapes. Champagnes in this area include the term ‘blanc de blancs’. The Côte des Blancs yields popular champagnes, which are known for light and delicate aromas, finesse and elegance. The Côtes des Blancs is the source of Chardonnay for many vintage Champagnes and prestige cuvées from the large Champagne houses. A Grand Cru village of the Côte des Blancs. Expensive Champagne created in 1876 by the house of Louis Roederer. Cristal was made at the insistence of Tsar Alexander II of Russia and put in a clear bottle because the Tsar insisted that his personal champagne be visibly different from all the others. The process of filtering off the sediment from the grape juice shortly after pressing so that the remaining juice is clear before it starts its fermentation. The removal of the yeast sediment after the second fermentation and before the champagne is sold. This process is now done by machine. The sediment is collected in the neck of the bottle and this is then plunged into a freezing liquid causing an ice cube to form, trapping the sediment inside it. The temporary cap is then removed and the pressure inside ejects the ice cube taking the sediment with it. Not the inventor of Champagne but certainly the man who laid the foundations for the improvements in quality and popularity. Dom Pérignon was a monk at the Abbey of Hautvillers. Dom Pérignon introduced the practice of blending grapes from different areas to create a better Champagne. He also started to use corks not wooden stoppers, and introduced strong glass bottles to contain the fizzy wine. The Champagne bearing his name is made by Moët & Chandon, first sold in 1935. The process of adding a small amount of liquid sugar at the very end of the Champagne making process to adjust the level of sweetness. All the sugar in the Champagne is used up during the fermentation and turned into alcohol. Therefore the Champagne is very dry, hence the need to add extra sweetness. The more sugar you add (it’s measured in grams of sugar per litre of champagne or g/l), the sweeter the result. This is the ranking system for Champagne villages according to the quality of the grapes grown there. There are roughly 323 villages in Champagne. 17 are regarded as Grand Cru (ranked as 100% in terms of quality). 42 villages are classed as Premier Cru (between 90% and 99% in quality). All other villages are rated as between 80% and 89% and are designated as Cru. The words ‘Grand Cru’ or ‘Premier Cru’ will appear on the Champagne label if the grapes used in that particular Champagne are of the relevant quality. An important town in thee Champagne region and a hub of the Champagne trade. Home to several famous brands such as Moët & Chandon, Pol Roger and Perrier Jouët as well as hundreds of smaller houses. The reaction of yeast on the grape skins with the sugar in the grape juice, as it runs off the press, produces alcohol and carbon dioxide gas. This turns the grape juice into still wine as the gas escapes into the air. Occurring after the 1st fermentation; certain bacteria in the still wine break down the harsh malic acid and turn it into milder lactic acid. It is thought that malolactic fermentation makes a Champagne smoother and more complex. Some champagne houses deliberately choose not to carry out malolactic fermentation to produce a different and distinctive style of their own. In theory the third fermentation but rarely referred to as such. When the still wine is transferred into bottles a measure of sugar and yeast is added before the bottle is sealed. The same chemical reaction as happened in the first fermentation takes place inside the bottle. The alcoholic strength of the wine increases and the CO2 gas, which cannot escape from the bottle, dissolves into the wine, creating Champagne’s bubbles. The final stage of the wine tasting process. If the taste lingers strongly in the mouth after you have swallowed a sip it is said to have a ‘long finish’. This should be considered a good thing and is considered to be the mark of a well-made Champagne. Spring frosts that can be very dangerous to the vines and more particularly to the vine’s tiny buds. No buds will mean no grapes. In the late 1800s an insect pest (much like an aphid) called Phylloxera invaded and wiped out of the world’s vines by attacking the roots of the vine plant. The only successful way of combatting the insect was to take a root stock from America (this was where Phylloxera originated and as a result American root stocks were resistant to it) and graft onto the root, cuttings from other grapes varieties, including the native French ones hit by Phylloxera. This practice continues to this day and has become an art in itself and a fundamental part of viticulture the world over. A bunch of grapes. Note that a single grape is called une baie. 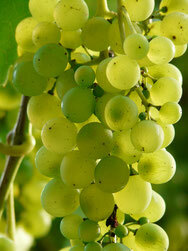 A later harvest to remove any remaining grapes that were either unripe or unnoticed when the main harvest took place. If the maximum permitted yield has been reached this is not allowed. The site of the abbey where Dom Perignon lived and worked and where he is buried. French for stainless steel. In Champagne this means the stainless steel vats used to store wine (as opposed to more traditional enamel, or wooden vessels). Inox is easier to keep clean and can be temperature controlled to ensure that conditions are perfect for the fermentation and storage of wines. Traditionalists say that stainless steel takes away the soul of the wine rendering it rigid, cool and inflexible with none of the warmth and depth of enamel, or oak barrels. Labour refers to ploughing along the base of the vines to aerate the soil and encourage the vine roots to penetrate deeper underground. The slat of wood used to stack bottles ageing in the cellar. A latte is usually inserted between every fourth layer of bottles. The yeast sediment left inside the bottle after the second fermentation. Lees are dead yeast cells which slowly decay and release the amino-acids, enzymes and other nutrients which allow the tastes and aromas of the Champagne to develop. A Grand Cru village in the Côte des Blancs and as a result produces excellent Chardonnay grapes. On wine labels its name is often shortened to Le Mesnil. 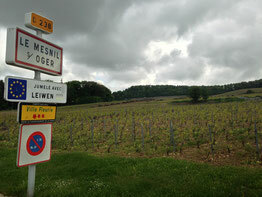 A Clos-type vineyard in the village is the source of Krug's Clos du Mesnil. A small area of vineyard with a specific name. Some Champagne makers produce a champagne using only grapes from one single lieu-dit . These Champagnes give expression of the subtle differences that the soil and ‘terroir’ can bring to the Champagne. Liqueur is the name given to the liquid added either at the moment of bottling (liqueur de tirage) or just after dégorgement (liqueur d'expédition). The first is a mixture of yeast and sugar designed to provoke the second alcoholic fermentation inside the bottle. The second is a mixture of wine and sugar to replace the small volume lost during dégorgement and also to adjust the sweetness of the Champagne before it is sold. One of the four principal Champagne areas. Located South of Reims and primarily producing Pinot Noir grapes, it is home to 10 of the 17 Grand Cru classed villages. 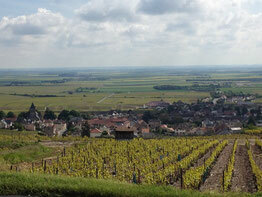 A Grand Cru classed village located in the Côte des Blancs area of Champagne. A single plot of vines. There may be several parcelles in one lieu-dit, but often the lieu-dit is so small that is consists of only one lieu-dit. One category of Champagne maker referring to someone that grows grapes in their own vineyard and uses the grapes to produce their own Champagne. In practice it means the smaller Champagne makers and the Champagnes they make which are often called Grower Champagnes. The RM is not allowed to buy, from third parties, more than 5% of the grapes he or she uses to make their champagne, unlike an NM (see definition). ‘RM’ will appear on the Champagne bottle label along with the Champagne maker’s registration number. The process of ‘Remuage’ or ‘Riddling’ is the process of gently twisting and raising each Champagne bottle so that the yeast sediment resting on the underside of the bottle slides down to the neck. This takes between one to three weeks, depending on whether it is done manually, or by machine. His is the name given to bottles stacked in the cellar to age. The name refers to the wooden slats inserted between rows of bottles to stabilise the pile. During this ageing period Champagne can be bought by one Champagne maker from another with the buyer finishing off the production process and selling the champagne under his own brand name, even though he did not start the process. Champagne bought in this way is called Vin sur latte. The name given to bottles stored vertically with the neck downwards. This slows the ageing process and allows Champagne to be kept for extremely long periods. Pruning. Strict rules exist as to how you must prune your vines. Some Vignerons start pruning in November and others wait until March the following year. Bottling. Prior to being put into bottles a carefully measured quantity of a liquid yeast solution are added to the still wine to ensure that the second alcoholic fermentation starts inside the bottle and creates the Champagne’s bubbles. Tirage can't take place before 1st January of the year following the harvest. Champagne makers will choose their own dates according to when they feel the wine is ready.